The oppression and attempted genocide of the Israelites. The birth of Moses, his hiding and his adoption. *SFFS 2189 A Mother Lined a Basket (Keithahn) Quite a remarkable song about the risks we take in letting children go. "A mother lined a basket to keep her baby dry, then rocked him on a river lest he awake and cry, She let a princess name him, her son, that he might live, God's people had a leader, she had such hope to give". Lyrics. TiS 689 / ATE 286 / GtB Lord hear my praying, listen to me / Sorrowing song (Robin Mann) Powerful words of prayer to a simple tune. Words are straightforward about asking difficult questions of God. Lyrics (loads a pdf). ATA192 When people despair we would bring hope (Douglas Simper / Neil Quintrell) A good song looking positively at how we can encourage others in times of difficulty, and a prayer to the Spirit. Recorded music Pharoah (Richard Thompson) This song is about the modern Pharoah, and our slavery to money. The recording I have of this is by June Tabor, which is quite menacing. Richard Thompson wrote it. Oh, one more version, very celtic, from The House Band. Online Resource The Children come (Carolyn Winfrey-Gillette) For those in the USA, this new song focussed on care for unaccompanied children entering the USA is particularly appropriate this week. Sheet music. TiS 629 / AHB 558 / AoV2-136 / ATA 197 / CH544 / VU600 / Lau888 / StF256 When I needed a neighbor were you there (Carter) A classic folk church song. One story of hope that I think is great for kids is how Pharoah's daughter cared for Moses regardless of where he was from. I think this song would work well to tell that part of the story. Lyrics. Good for kids. Oldy-but-a-goody. Recorded music River Lullaby (Grant) From "Prince of Egypt". This song is quite mushy, but maybe it might be useful to think about the love of Moses' mother, and any mother who must leave her child and hope for his or her survival in the face of great danger. Youtube. Good for kids? Strength in the face of oppression. Tune In: You in all our worries / All will finish well (Brown) “In this world where injustice reigns, you are in the midst of pain”. Excellent words of reassurance in a difficult world. Sound sample, lyrics and songbook. *Tune In: Come O God and visit us sick we pray / Your abundant life (Brown) A joyful song "Lead us into your abundant life". This has been sung frequently by the musicians at BUC, but not by the congregation! Lyrics and sound sample. *Public Domain: Freedom is a constant struggle I love this song and I think it might work with this reading. Could be good used during prayers of confession or a time of lament. Lyrics. Historic sound sample. AoV2-149 / NCH570 / UMH533 / HPP311 / GtG379 / G(II)522 / GC724 / GC(II)711 / G(3)817 / W&R512 / Cha630 / ZSS106 We shall overcome (Horton/Hamilton/Carawan/Seeger) Particularly good if your congregation is facing struggle. Other songs from the Civil Rights era would also fit well with this Psalm. Here's the sound of Martin Luther King Jr talking about the power of this song. Oldy-but-a-goody. *NCH497 / SFFS 2208 / GtG741 / PH354 / G(II)508 / GC707 / GC(II)684 G(3)780 / CP513 / ZSS141 Guide my feet while I run this race An excellent civil rights song. Would work well as a meditative prayer for guidance or as an uplifting call to action at the end of the service.You could also make up your own lyrics. Lyrics. Good for kids. *NCH Psalter Our help is in the name of God (Marshall) Simple refrain and good paraphrase of the Psalm for a cantor, chanting, or to be read with a response. Linnea Good Blessed Be God (Good) This will need to be taught, but won't be too hard. Get one part of the congregation on the chant part (God before me….) while the others sing the top part, and then add in other parts as you are able. Tune In: Come O God and visit us sick we pray / Your abundant life (David Brown) A joyful song "Lead us into your abundant life". Lyrics and sound sample. *URW357 Praise to the One who sets prisoners free (Elise Eslinger) This is written as a refrain for Psalm 146, but I think that refrain alone as a round would be good for the kids' song. Good for kids. NCH Psalter Great is the glory of God A very simple refrain for a chanted (or read) Psalm. *Linnea Good I lifted my voice and spoke your name, your word of answer swiftly came a very simple congregational response to the Psalm being spoken. It would be great to do this. Need a confident reader who can preferably lead the singing, or an attentive musician to come in at the right spot. Good for kids. *Emergent Psalter They shall sing of the ways of the Lord (Isaac Everett) Simple psalm refrain and Psalm spoken over music in between the refrains. Sheet music (antiphon only). 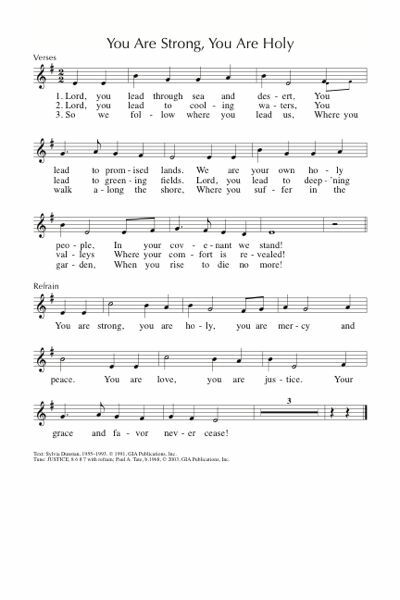 GC(II)700 / G(3)799 Lord you lead through sea and desert / You are strong you are holy (Dunstan) Simple version of this psalm with a strong chorus. I don't know if our congregation would like it though. Sheet music. Sound sample. TiS 86 / Srce793 With my whole heart I will praise you O Lord (Duba) This refrain is fine. Verses should be read, perhaps while playing the chords in the background. Make sure to keep the chord quiet enough so they are not too distracting. *NCH085 / SFFS 2082 / Cha623 / ZSS105 Woke Up This Morning (African-American Spiritual) A great Spiritual. If you don't have one of these sources, you can just make it up from this video. This could be a good Sunday to make use of those choir stalls... Good for kids. Oldy-but-a-goody. ATW 480 On the day I called (Bernadette Farrell) A simple song. Sound sample. Holy bodies, the church as one body. ATFG561 / Tune In Community (Brown) A song about being welcomed and part of a community. Sound sample and lyrics. Good for kids. "Part of a family interconnected, this is community; Welcoming strangers, visiting neighbours, this gives us dignity". *SFFS 2228 / GtG027 / StF618 / Online Resource Sacred the Body (Ruth Duck) Excellent words - and it's not easy to find good songs for this passage. The tune is new, but very simple and beautiful. It will be picked up very quickly by most congregations. "Sacred the body God has created, temple of Spirit that dwells deep inside. Cherish each person; nurture relation. Treat flesh as holy, that love may abide." Tune and lyrics from Baylor University Christian Ethics Hymns Library (an excellent resource!). GGives1 Oh a body can't walk on its nose (Emmanuel Covenant Community) Great little song about being part of the body and working together. Chorus is "Oh I can't do without you and you can't do without me, 'cos each little member has a special work to do, to make the body grow". Lyrics. Good for kids. AoV2-013 / AoVK-108 Different Gifts yet we are one (Russell) Perfect words for this passage. Tune is a bit tricky. AoV1-129 / CH665 / UMH620 / VU467 / ELW701 / HPP525 / A&M461 / GtG530 / G(II)599 / GC830 / GC(II)813 / CP073 / W&R689 / Cha393 / Lau832 One bread, one body. A classic. Don't play it too slow or it takes forever!! Particularly appropriate if you are celebrating communion. WoV708 Grains of wheat richly gilded / Una espiga (Gabarain) Spanish language communion song, with good words about how the grain is transformed into one loaf, we are also transformed into one body. Excellent imagery, and good to sing, especially with guitar. AoVK-148 / ATOK 388 There is one body (Trish Watts / Monica O'Brien) A good energetic song of unity. Good for kids. MV141 We are all one people (Naytowhow) This Native American song really gets stuck in my head. I think it's really good. Might take some work to get your congregation going with it, though. GtG768 / StJ / GC(II)645 We Are the Body of Christ / Somos el Cuerpo de Cristo Bilingual verses and choruses. Will be good for a congregation where both languages are spoken. *MV153 Body, mind and spirit “Body, mind and spirit, in god’s image born to be. Sing, rejoice in life most sacred. Revel in mystery”. A simple 4 verse chant-like song. Simple enough for the congregation after playing it through once. Really good words. UMH438 / VU416 / A&M476 / CP467 / CP(E) 430 / W&R718 / StF550 / Lau861 / MP159 Forth in thy name O Lord I go (Charles Wesley) Timeless words about committing all our works to God. I like this hymn best played lightly and joyfully with a simple drum beat as a kind of minstrel tune, rather than a hymn. The old fashioned words seem to make a lot more sense to me that way. Some hymnals (including TiS) have sensitively modernised the words. Older lyrics. Oldy-but-a-goody. AoVNG102 We are One Body in Christ (McKenna) Good words, and I can't remember why I liked this because I can't find the sound sample online anymore. Here are the lyrics. TiS 468 / NCH309 / PH436 We are your people Spirit of grace (Brian Wren) I really like the lyrics to this one, but the tune is a bit funny and the hymn is quite long. It needs something to stop people plodding through it; maybe split the singing into male/female or different sides of the congregation. Sheet music. AoV1-086 / G(II)530 / GC733 / GC(II)727 / G(3)834 We are many parts, we are all one body (Marty Haugen) I like the chorus much better than the verses, but they are really okay too. The sound sample at Hymnprint is horrifically slow, but look at the sheet music there. AoVK-21 Weave one heart (Marty Haugen) Excellent song, with call and response verses "many colours woven into one" Good for kids. AoVK-119 We're God's family God's children (Trisha Watts / Monica O'Brien) Good words. Catchy tune. Good for kids. ATAR632 Share your gift (Busch) A good song for the offering, particularly on Sundays when the theme of being part of the body of Christ, or sharing gifts or talents is being explored. Words are simple enough to make sense to kids. Good for kids. 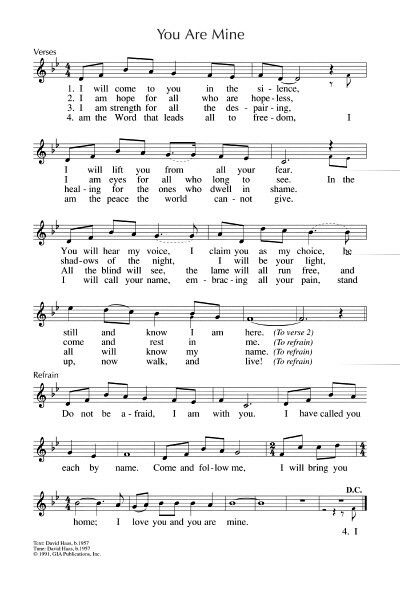 Online Resource You gave us these bodies / This is my body (The Many) This is not a congregational song, but is very beautiful and apt for this reading; you could play a recording or have your musicians prepare it for the congregation. Sheet music, sound samples etc. Who do you say I am? Declaration of Christ as Messiah, and Peter as the rock. Strange words about binding and loosening on earth and in Heaven. ATFG532 Jesus asks (Park) Lovely words of Christ as "blossom of freedom", "beam of hope" and "maker of peace". From the Korean "Jesu neem un nu gu shin ga". ATW 459 I don't believe in a God up in the sky / God Version 1.0 (Robin Mann) An excellent rock song about how God doesn't necessarily work in the way we think. Lyrics and mp3. Good for kids. StS051 Quién Dicen que Soy Yo/Who Do You Say that I Am? (Cortez). A quiet and reflective bilingual song (Spanish / English). Also available from OCP website. Sound sample here. *AoVK-36 / VU649 / SFFS 2242 / URW118 Walk with me I will walk with you (Rice) Nice simple words about being sent to do God's work. Also mentions Moses' call, which will feature next week, so you could sing it again. Good for kids. I'd love to hear your ideas - What will you be singing? Please add a comment below.